Hector is a lovely Springer Spaniel who has been visiting us since he was a little pup of 8 weeks old. He has now reached the ripe old age of (nearly) 14! At the end of November, Hector was rushed into us as he was unable to stand and was very distressed and disorientated. He was seen immediately by a triage nurse for an initial assessment and then a veterinary consultation following that. His main symptoms on presentation were a head tilt to one side and rapid involuntary eye movements from side to side – known as ‘nystagmus’. A common cause for these symptoms is known as ‘Vestibular syndrome’. The vestibular system includes parts of the inner ear and brain which control balance and eye movement. Vestibular syndrome can occur when parts of this system are affected. 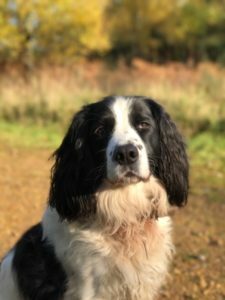 The duty vet carried out a thorough examination on Hector to help determine whether the cause of his symptoms could be due to either ‘central’ or ‘peripheral’ vestibular syndrome. This includes eye and ear examinations, and spinal and limb reactions/movements. Hector was suspected of having peripheral vestibular syndrome, with an ear problem being the possible cause. It was decided that it was in Hectors best interests to be admitted to the hospital for nursing care and symptomatic treatment. Hectors treatment plan started with pain relief and anti-inflammatory medication in order to reduce any inflammation in his ear and provide comfort. He also received antibiotics to cover a possible inner ear infection, anti sickness medication as the head tilt and eye movements can lead to nausea, and topical ear treatments to treat the initial cause. Hector was recumbent in the hospital and required round the clock nursing care. This included regular lifting and turning to prevent bed sores and muscle wastage and regular bathing to keep him clean. He needed hand feeding and syringing water as he was unable to do this himself due to his symptoms. Hector was very keen on his TLC from the nurses, enjoying his face washes, grooming sessions and cuddles! By day 5, the night shift nurse had him up and in the garden for an unsteady and wobbly walk! Another day in the hospital and Hector had improved even further and was eating and drinking on his own, walking and wagging his happy boy tail! He was then able to go home on medication and return for follow up appointments. Hector is such a friendly gentleman with a loving heart, who is still always so pleased to see us even after his ordeal, and truly deserves to be our Braveheart of the month.